by Dr. Roger Louis Martinez-Davila. A special thanks to Extremeño and historian, Marciano de Hervas, for his research and writings on this event. Plasencia was not free of anti-Jewish sentiment as there were serious disruptions to the traditional residential intermixing of Jewish and Christian families. 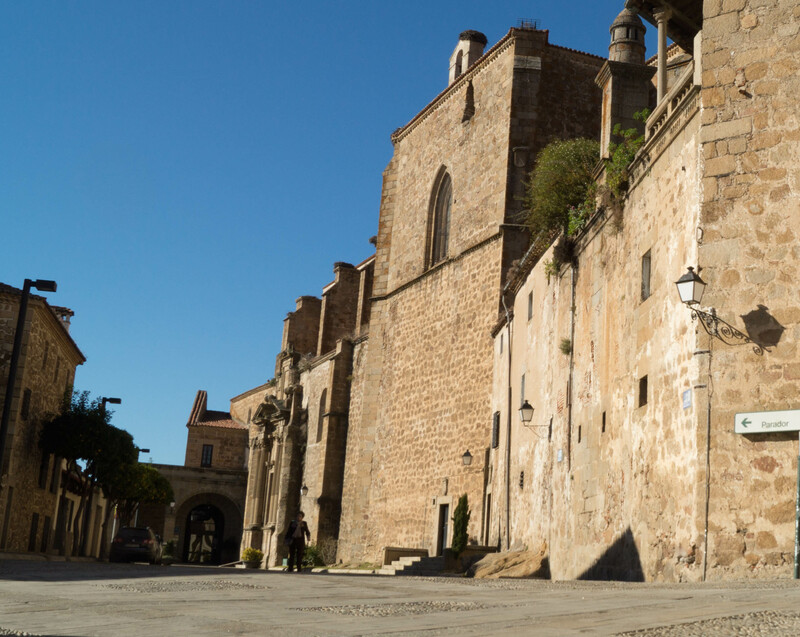 Ever since the 1390s and the massive anti-Jewish riots that characterized this period Jews in the Kingdom of Castile and in Plasencia resided in a religiously-charged environment that placed their communities in economic, religious, and physical jeopardy. Although the exact date of construction is unknown, sometime before 1416, several Jewish families found it necessary to live in a fortified and gated collection of homes known as the Apartamiento de La Mota. This enclosed section of homes was located across from the Church of Saint Nicolás. Contemporaneous militant Christian evangelization of Jewish communities in the region during the early 15th century may have been the impetus for the creation of La Mota. In 1411, Vicente Ferrer, an aggressive proselytizer in the Jewish aljamas of the Kingdoms of Aragon and Castile preached in the cities of Zamora and Salamanca, which are located just north of the city of Plasencia. Ferrer went as far as to preach his message of conversion in these communities’ synagogues. 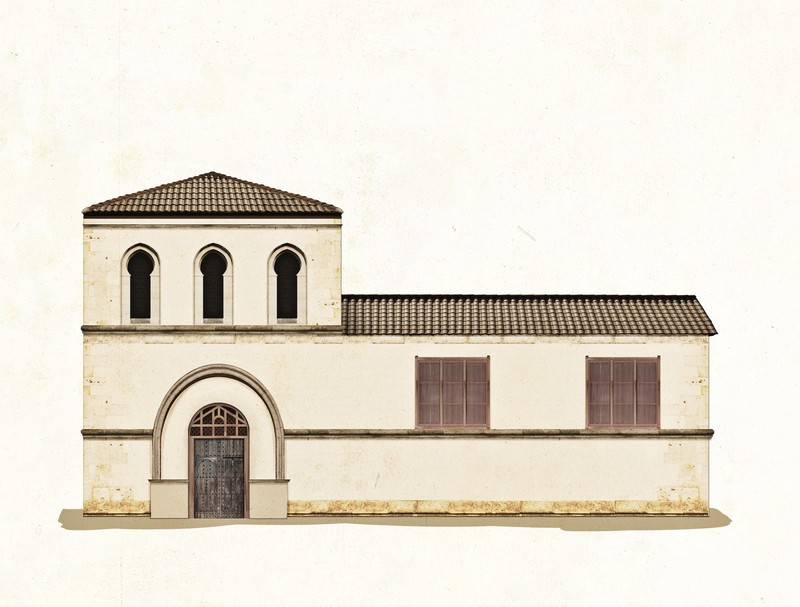 Our reconstruction of the destroyed synagogue is based on contemporaneous synagogues in Avila, Toledo, and Cordoba. Artwork by David Seidman. In response to these Christian initiatives, Plasencia’s Jewish community built the enclosed Apartamiento de La Mota, which was secured with stone walls surrounding both homes and the synagogue. The large wooden doors of La Mota were likely festooned with bronze or steel hardware and at night they could be closed and locked from within by a large metal bar (aldaba). In 1416, there were two zones within the apartamiento—one area contained the synagogue and multiple Jewish homes, and the other area included the dwellings of Tel Diaz de Vega, a local Christian city councilman (regidor). Fernándo entered into the houses lived in by Yucef Castaño [and other Jewish residents]. These houses, the best of all of them, had been owned by Tel Diaz. [Fernándo] took possession of the homes by physically walking into them…and then he closed all of its doors. He then opened the doors and shook the hands of Ledicia and her husband, Symuel Abenabibe, and all of the other Jews living in these homes. In this manner, Fernándo de la Mota proceeded to secure all of his houses in the apartamiento. Unfortunately for these families, less than eight months later the properties were sold again and purchased for 100,000 maravedis by Iñigo de Camudio, the shield bearer of Alonso de Sande. By 1426, less than a decade after taking possession of these homes, the new owner forced all of the Jewish clans from their homes. Thus, Plasencia’s Jewish community was ultimately unable to secure an adequate protective zone. La Mota came to resemble the traditional mixed-religious residential pattern previously characteristic of Plasencia. The displacement of Jews from this part of La Mota was not necessarily part of any Christian plan to prevent Jewish families from separating themselves from the rest of the city’s population. Rather, their ejection from these domiciles appears to be the product of a brewing competition among the region’s local caballeros (knights), the cathedral of Plasencia, and the Estúñiga family. Specifically, Iñigo de Camudio’s purchase of these homes in La Mota appears to have been part of a secret arrangement for the Estúñigas to acquire property in Plasencia. Iñigo had served a critical role, some might say a deceptive one, when he executed the purchase of this section of La Mota not for himself or his lord, Alonso de Sande, but for Alonso’s superior—Pedro de Estúñiga, the Count of Béjar, who was positioning to extend his political influence over the region. After the mid-1420s, the Estúñigas would quickly consolidate their land holdings in this section of the Jewish quarter, which would in turn lead to a significant conflict with the Carvajal and Santa María confederation. The Estúñiga’s efforts to secure properties in La Mota, which disabled the protective benefits provided to the local Jewish community, were only the beginning of a darker time for Plasencia’s Jews. Just a few years later, in 1431, a tumultuous regional conflict would find Rabbi Abraham de Loya imprisoned and two of his coreligionists murdered. Archivo Historico Nacional – Seccion Nobleza (AHNSN). Osuna, Caja 298, Documento 3/17; Hervas, Historia de los judios de Plasencia y su tierra. Vol. II: 86-92, 100-102; Hervas, Historia de los judios de Plasencia y su tierra. Vol. I: 38-50. José M. De Garganta and Vicente Forcada, Biografía y Escritos de San Vicente Ferrer (Madrid: Biblioteca de Autores Cristianos, 1956), 172-173. Ibid; Benavides Checa, Prelados Placentinos, 154. While there is no explicit evidence describing Ferrer’s travels within the Diocese of Plasencia, the Estúñiga family would late construct a monastery bearing his name in Plasencia’s La Mota. AHNSN Osuna, Caja 298, Documento 3/17, Folio 42v. Ibid., Folios 45-46v; Hervas, Historia de los judios de Plasencia y su tierra. Vol. I: 42. AHNSN Osuna, Caja 298, Documento 3/17, Folio 77v. AHNSN Osuna, Caja 298, Documentos 3/13 and 3/14; Hervas, Historia de los judios de Plasencia y su tierra. Vol. II: 100-102.